The first thing I do when I come up with a recipe is taking a note on my phone. Then I usually move onto testing it, and make necessary changes. If I decide to post the recipe, I either picture what the dish is going to look like in my head or doodle it out on my sketch pad. I remember finishing all those steps for this recipe months ago. I was ready to work on my post, then my husband and I went to a bar (nice bar, not a trash one) and ordered chicken wings. And oh boy, were they the worst chicken wings we’d ever had…I think they were one of the worst things I ever had to put in my mouth. I just couldn’t get it, who messes up chicken wings? Not only we stayed away from eating any type of chicken wings after that, I couldn’t even hear the word ‘chicken wings’ without having a gag reflex. Because of that traumatic experience this recipe that I was supposed to have it on my blog many months ago had to wait. I am glad to let you know that wings I finally made for this post helped me and my husband recover from the worst chicken wings of our lives. I think it took just about 20 seconds or even less for him to finish a wing, and he also said that he could eat about a hundred of those. 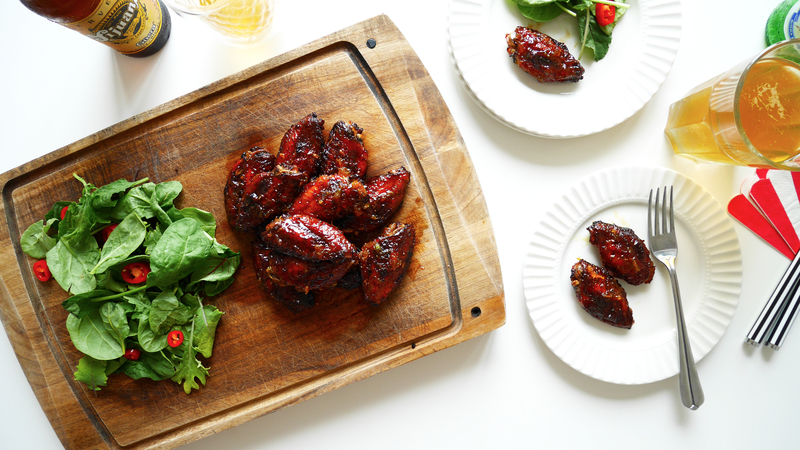 These mouth-watering wings are great crowd-pleaser, and super simple to make. They’re also oven baked not deep fried, so a little healthier 😉. Try them this weekend! 1. Mix soy sauce, grapeseed oil, worcestershire sauce, cayenne pepper, smoked paprika, black pepper and garlic powder. Marinate chicken wings in the mixture for at least 1 hour. 2. Pre-heat oven to 190c. 3. Line a tray with aluminium foil. Coat the foil lightly with cooking spray. 4. 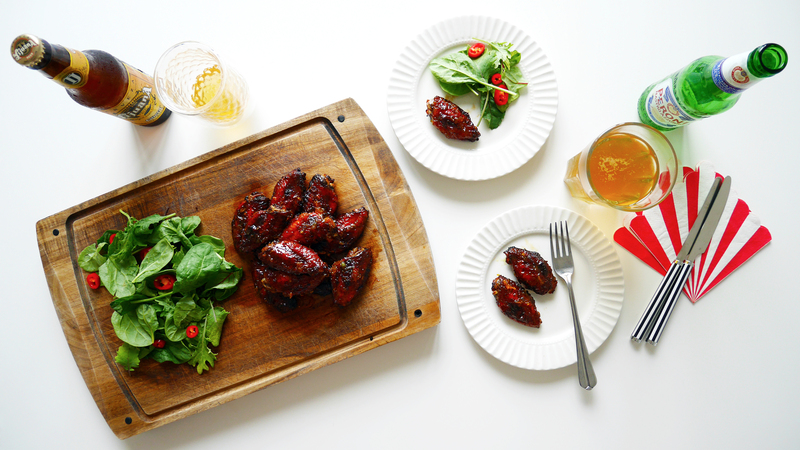 Place wings on a tray, bake for 35 minutes or until wings are cooked through. 5. Meanwhile, add zest and juice of 1 large orange and 2 tablespoon of honey in a sauce pan. 6. Stir and cook for 5-6 minutes over high heat until mixture starts to reduce and become slightly syrupy. Leave rest of the glaze in a pan. Keep heating until it becomes sticky marmalade-like. 7. Take out the chicken wings when they’re cooked, coat them with half of orange and honey glaze. You can use a brush. 8. Put the wings back in the oven, turn the heat up to 220-225c, cook for another 4-5 minutes for crispy skin. Watch closely and make sure they don’t burn. 9. Take them out when ready and let them cool for a few minutes. 10. 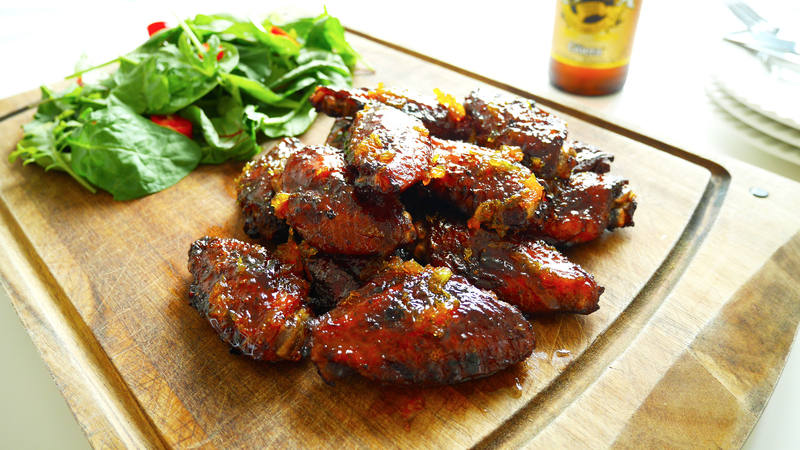 Brush sticky glaze onto chicken wings before serving. Make sure you have plenty of napkins on the table. Enjoy! Thank you Sandhya 🙂 Yes, I cannot believe that place ruined the chicken wings for me for months! Thank you Petra! I agree. I love eating out, but getting more and more appreciative of home-cooked dish. I love to eat out too but mainly foods I don’t make but I will always love a plate of good food 🙂 Have a great week ahead!